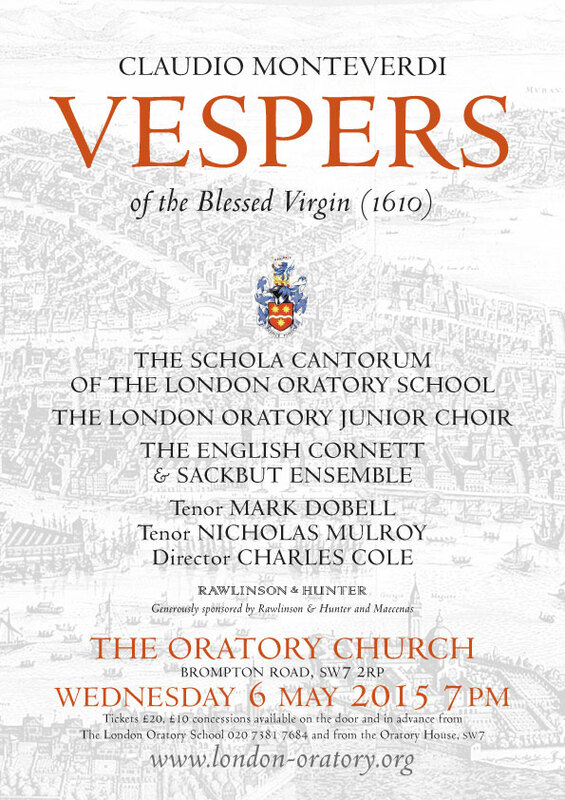 Tickets are selling fast for the performance of the Monteverdi Vespers at the London Oratory Church on Wednesday 6 May 2015 at 7pm. The performance will be sung by the Oratory’s two children’s choirs: the Schola of The London Oratory School for boys aged 8-18, and the London Oratory Junior Choir, the Church’s own children’s choir for boys and girls aged 8-16. They will be accompanied by the English Cornett & Sackbut Ensemble and two tenor soloists, Mark Dobell and Nicholas Mulroy, directed by Charles Cole. The concert is generously supported by Rawlinson & Hunter and Maecenas. Tickets priced £20 (£10 concessions) are available in advance from the Oratory House, SW7, in the courtyard to the left of Brompton Oratory, and from The London Oratory School 020 7381 7684. Tickets will also be available on the door on the evening of the concert. All seating is unreserved and the Church will open at 6.30pm.